With this week's deal between video-streaming site Hulu and media mogul Disney, the face of television as we know it is changing. The agreement between the two may only be the latest step in a transition that’s been taking place over the last four years, but it’s one that will have lasting implications not only for consumers, but for other players in the online television field. And yet, despite the fact that iTunes went on to offer shows from all the major networks, as well as most of their popular subsidiaries, buying television on iTunes has never really become the same phenomenon that buying music has been. Personally, I’ve only bought a couple of episodes from the iTunes Store and I’d imagine there are more than a few customers in the same situation. Far more of my friends and relatives buy music from iTunes than TV shows. I’m pretty convinced that the move to bring television to the iTunes was mainly a gateway towards proving that selling video could work online, in order to lend weight to the eventual introduction of purchasing and renting movies online. Motion pictures are, in many ways, inherently more suited to the way iTunes does business than television is. Why? A couple simple reasons. Firstly, buying television shows is expensive. For someone who spends as much time as I do following TV shows—and that, as my friends and colleagues can attest, is a big chunk of time—even buying just the shows I watch regularly is a multi-hundred dollar proposition. And the prices are hardly competitive. Let’s take The West Wing for example. A great show, but if you want to buy all seven seasons from iTunes it’ll cost about $280. Want to buy it on DVD, which gets you not only subtitles, but extra features like commentaries, featurettes, outtakes, et cetera? Amazon will sell it to you for $210. Sure, there’s the convenience factor of instant gratification, but is it worth the extra $70? Throw in the fact that I’m already paying for cable every month. I can’t easily do away with that cost, as the same company provides our house’s Internet tubes. So paying to download those shows means, for me, paying twice. Then there’s the issue of permanence. Sure, The West Wing might be good enough that I want to own the whole series from pilot episode to series finale. At an average of 10GB per season, I’m looking at 70GB—that’s not a ton by today’s standards of terabyte drives, but it’s still just one show. Turn that into four or five shows, and it starts to add up. And that’s standard definition. Season 3 of Lost in high-definition will take up 32GB on its own, at a cost of $50 (there, at least, Amazon is selling it for around the same price), but you still don’t get the extra features. But the biggest problem that iTunes has had to overcome in the television market is consumer inertia. 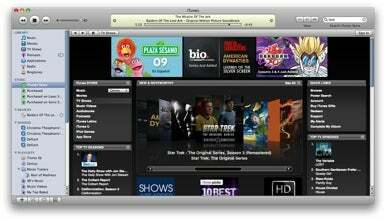 People are just getting used to watching television at the place and time of their choosing, whether it be via iTunes, DVR, or online streaming. When Apple introduced television shows on iTunes, Steve Jobs said: “We’re doing for video what we’ve done for music—we’re making it easy and affordable to purchase and download, play on your computer, and take with you on your iPod.” But people aren't used to shelling out per episode for something that they used to be able to get for free (or, at least, perceived as free). That’s where Hulu has succeded admirably. It sidesteps the crass issue of payment with advertisements, a model that most consumers are familiar and comfortable with (not to mention that there are far fewer ads on Hulu, at least for the moment). And there’s no issue of permanence: all the video is stored on Hulu’s servers in the mythical cloud, so you don’t have to find space on your hard drive or on your shelf. Plus, it’s arguably even faster than downloading a TV episode from iTunes—call it instanter gratification. The last remaining advantage iTunes truly holds is portability, letting you take your video with you in places where you don’t have a network connection. But those cases are being eroded. In March, for example, I watched a full episode of the NBC drama Kings on Hulu at 35,000 feet, thanks to Wi-Fi provided by Virgin America, and it was seamless. And if Hulu truly does roll out a rumored iPhone app, then there will be few places you won’t be able to get access to television. Of course, Hulu does have some weaknesses of its own. For one thing, it's available only in the U.S., while iTunes has expanded its television reach to countries like the U.K., Australia, Canada, France, and Germany. More prominent, though, is not Hulu's geographic restrictions, themselves presumably the result of rights issues, but rather its seemingly maniacal bent to keep its content limited to computer screens instead of televisions—no doubt to appease the networks who own most of the service. For example, over the past view months, Hulu has engaged in a back-and-forth battle with media center software developer Boxee. I've just started using Boxee recently myself, in conjunction with a Mac mini and my first HDTV, and the ability to stream Hulu to your living room TV feels nothing short of futuristic. It's understandable—if not really sympathetic—that the networks want to keep their content off those big screens, but I think it's only a matter of time before they're forced to relent. They can't play hide-and-seek with Boxee forever, especially if they want to move television into the future. So where does that leave iTunes? Perhaps there is still a future in purchasing television content online. Maybe the company could make a subscription model work for television in a way that it never could imagine for music. But as Hulu continues to gain strength by expanding its content partnerships and improving its features, I start to suspect that that ship has steamed off into the sunset. Could Apple buy Hulu? I suspect not, as the venture will now be owned roughly equally by Fox, NBC, and Disney, and the television networks are going to be reluctant to cede that control to Apple, having seen what happened to the music industry. But the two would seem to make for natural partners. Admittedly, Apple’s not always great at playing with others, but Steve Jobs’s close ties to Disney could be an asset here. Apple should work with Hulu as it did with YouTube to encode the site’s content in H.264 for streaming via the iPhone, iPod touch, and Apple TV. (Update: I stand corrected. Any video available in Hulu's enhanced 480p format is already encoded in H.264.) That'd help bolster the Apple TV's capabilities—perhaps even elevating it from its "hobby" status—as well as helping Hulu with one of its weaknesses by allowing consumers to watch shows on their big living room HDTVs instead of their office or bedroom computer displays. While they’re at it, why not put links on Hulu to purchase the shows on iTunes and vice versa: “Watch Now” links on the iTunes Store? Television as a medium is ripe for upheaval and Hulu and Apple could work together to make that happen.